It was March 11, 1973. With the premiere of A Little Night Music only two weeks before, forty-two-year-old Stephen Sondheim had experienced his third Broadway triumph in three years. After previously winning Tony Awards® for his work in Company and Follies, he would soon go on to win yet another Best Score Tony® for A Little Night Music and so become the only composer-lyricist in Broadway history to win the Tony® for three consecutive years. With eight musicals produced on Broadway in the previous seventeen years, Sondheim was finally enjoying acclaim as the innovator of a new form of musical theater. Sondheim was introduced professionally to the theatrical world at the age of twenty-five, when he was chosen by Leonard Bernstein to write the lyrics for West Side Story (1957). After his initial success on Broadway as a lyricist, he asked friend Burt Shevelove if he had an idea for a show. Shevelove suggested doing some of Plautus’s plays as a musical, and A Funny Thing Happened On The Way To The Forum was on its way to creation. But preparations for Forum were interrupted when Sondheim accepted an invitation to write the lyrics to Jule Styne’s music for Gypsy (1959). After the triumph of that show, Forum was finally completed (1962) and became the first produced musical for which Sondheim wrote both words and music. He then composed the score for the experimental Anyone Can Whistle (1964). It lasted only nine performances but quickly became a legend, celebrated for its offbeat subject matter and Sondheim’s innovative score. Do I Hear A Waltz? (1965), a show for which he wrote the lyrics to Richard Rodgers’s music, proved to be the last of Sondheim’s “lyrics only” musicals. Working closely with producer-director Harold Prince, Sondheim, in successive years, turned out the scores for Company (1970), Follies (1971) and A Little Night Music (1973), thereby securing his place as one of the vital creative theatrical forces of his generation. On that rainy, muggy night in New York, a crowd of celebrities, journalists and musical theater fanatics gathered inside the Shubert Theatre for an evening that would be talked about for years to come. It was the first public acknowledgment – in the form of a musical retrospective – of Sondheim’s work in the theater. It had all begun five months before, when the American Music and Dramatic Academy and the National Hemophilia Foundation first proposed a fundraising event – a tribute – to honor Harold Prince. Prince declined the honor, but Sondheim agreed to participate in Prince’s stead, thinking the affair was “merely a dinner.” Little did he know that it would turn out to be a musical production featuring thirty-three performers and a thirty-piece orchestra. AMDA called upon Kurt Peterson, one of its alumni, to help organize the event, and Peterson asked Craig Zadan and Neil Appelbaum to join him as co-producers. As it became increasingly apparent that the Tribute would actually be a show, Burt Shevelove agreed to direct the evening, and Donna McKechnie (at the time, one of the featured stars of Company) was engaged to choreograph the production numbers. The event would be staged at the Shubert Theatre on Boris Aronson’s country-garden set for A Little Night Music. And only actors who had been featured in Sondheim shows would be invited to perform. Ethel Merman was asked to sing some songs from Gypsy, but she had previous plans to visit her daughter in Florida and refused to alter her vacation schedule. So Merman was out. Zero Mostel demanded that he be given an inordinate number of songs from A Funny Thing Happened On The Way To The Forum. Doing just one or two numbers was “out of the question.” Mostel was out. Lee Remick (Anyone Can Whistle) frantically tried to free herself from a film she was shooting in London so that she could come to New York for the weekend. To her (and everyone’s) dismay, that proved impossible. But those setbacks did not deter the producers and the director from assembling a star-studded cast of performers. Angela Lansbury, who had made her musical comedy debut in Anyone Can Whistle, flew in from London where she was rehearsing for the first West End production of Gypsy. For the Tribute she would re-create her two show-stopping numbers from the ill-fated but affectionately remembered score of Whistle. Nancy Walker, who had co-starred in the West Coast revival of Forum with Phil Silvers, arrived from Los Angeles to sing “I’m Still Here” from Follies. Chita Rivera came aboard to re-create one of her show-stopping moments from West Side Story. Most of the original cast of Company – Larry Kert, Donna McKechnie, Pamela Myers, Susan Browning, Beth Howland, Steve Elmore and Teri Ralston – were on hand, as were Follies stars Alexis Smith, Dorothy Collins, John McMartin, Justine Johnston, Victoria Mallory and Ethel Shutta. Of the thirty-three performers that evening, Jack Cassidy was the only one who had not actually performed in a Sondheim production. But Cassidy was supposed to have starred in Sondheim’s very first show, Saturday Night, a musical the composer wrote (at the age of twenty-five) with Julius J. Epstein, one of the Academy Award®-winning screenwriters of Casablanca. The musical, about a group of Brooklyn kids who invest in the stock market in 1928, had gone through eight backers’ auditions (with Jack Cassidy, Alice Ghostley and Arte Johnson, among others) and over half the money had been raised when the show’s producer, Lemuel Ayers, suddenly died. As did the project. A few years later (after the opening of Gypsy) the project was scheduled to move forward under the direction of Bob Fosse. But before rehearsals were to begin, that production was cancelled, too. In the Tribute Cassidy got to sing a song from the show that might have been. Director Shevelove routined the evening into four main sections: songs for which Sondheim was only the lyricist; songs that were cut out of his shows either prior to rehearsal or on the road; songs that were comic, and a climactic line-up of songs for leading ladies. Several guest introducers made appearances, including lyricist Sheldon Harnick (who read a telegram from Sondheim’s absent Do I Hear A Waltz? collaborator Richard Rodgers) and composers Jule Styne, Leonard Bernstein and Mary Rodgers. Goddard Lieberson, the President of Columbia Records and the man known as the prime force behind the concept of original cast albums, talked about Sondheim’s “affectionate gestures to older show music” in Follies. Producer Diana Shumlin Krasny discussed her musical Anyone Can Whistle, and librettists Burt Shevelove (Forum), George Furth (Company) and James Goldman (Follies) talked about the origins of some of the songs in their respective shows. Harold Prince introduced the “crying shame songs . . . the ones that didn’t make it to Broadway because of length or structure or character changes.” Several were included in the tribute, some with only piano accompaniment, since they had never reached the point of being orchestrated. Larry Blyden (who starred with Phil Silvers in the Broadway revival of Forum) and Susan Browning sang Love Is In The Air, the original opening number of that show, eventually replaced by “Comedy Tonight.” Another Forum outtake, Your Eyes Are Blue (cut to make way for “Lovely”), was performed by Harvey Evans and Pamela Hall (who also appeared in the show’s Broadway revival). We’re Gonna Be All Right, sung by Laurence Guittard and Teri Ralston, was presented for the first time with its original lyrics, which were never used in the stage production of Do I Hear A Waltz? A fragment of Happily Ever After, a song that was cut from Company in Boston, and Being Alive, the number that replaced it, were performed by Larry Kert. Pleasant Little Kingdom, written for, and cut from, an early draft of Follies when it was known as The Girls Upstairs, was initially intended to lead into Too Many Mornings; in the Tribute, for the first time, Dorothy Collins and John McMartin performed the two numbers as originally written. Only a few weeks prior to the Tribute, A Little Night Music was previewing out of town. Two songs – Two Fairy Tales, sung by cast members Mark Lambert and Victoria Mallory, and Silly People, sung by George Lee Andrews – were dropped from the show prior to its Broadway opening. Here they were sung once more by the performers who introduced them. Other unfamiliar songs featured that night were Take Me To The World (sung by Marti Rolph) and I Remember (sung by Victoria Mallory), both from the 1966 ABC-TV musical Evening Primrose. Based on a John Collier short story, this horror musical about people who live in department stores all over New York was written by Sondheim and James Goldman; it starred Anthony Perkins and Charmian Carr. For the tribute, the songs were introduced by Perkins and performed with all-new orchestrations written especially for the occasion by Jonathan Tunick. Scattered rehearsals had been held by Donna McKechnie a few weeks prior to the show. With the exception of You Could Drive A Person Crazy from Company, for which Michael Bennett gave permission to re-create his choreography, all of the musical staging was new. But it was not until the morning of March 11th that the entire cast, orchestra and production crew met at the Shubert Theatre with Burt Shevelove in an attempt to bring some semblance of continuity to the event. In addition to putting on that evening’s show, though, this cast would be making a record as well. A recording contract had been signed to capture the show “live”; all royalties were earmarked for AMDA and the Hemophilia Foundation. According to Playbill Magazine, it was the first time in Broadway history that a benefit tribute was recorded by a major record label and made available as an original cast show album. That, in and of itself, presented many difficulties. The orchestra pit of the Shubert was so packed with musicians, music stands and microphones that one of the cellists had to be sent home. The acoustical separation of instruments that is normally vital for sound recording was an impossibility. The Overture, created especially for the evening by Jonathan Tunick, arrived for the first time that morning, so the orchestra devoted much of its cherished rehearsal time to learning the eleven-minute opus, under the indefatigable musical direction of Paul Gemignani. However, once the lights had dimmed and the overture began, it was clear that the night would soon be a once-in-a-lifetime experience. The event, which lasted over three hours, was an explosion of energy rarely seen in any theater on any night. One show-stopper after another propelled the evening. Total pandemonium reigned by the time Ron Holgate (from the original cast of Forum) sang Beautiful Girls (from Follies) and out came six of the First Ladies of the Broadway theatre: Alexis Smith, Angela Lansbury, Hermione Gingold, Glynis Johns, Nancy Walker and Dorothy Collins. But with all the magical performances that night, the most moving moment occurred when Stephen Sondheim took his place at the piano and sang an emotional and personal interpretation of the title song from Anyone Can Whistle. The tearful audience that stood and cheered the evening to a stunning climax had no way of knowing that in years to come they would be cheering other great singers singing more great songs from future Sondheim shows like Pacific Overtures, Sweeney Todd, Merrily We Roll Along, Sunday In The Park With George, Into The Woods, Assassins and . . . 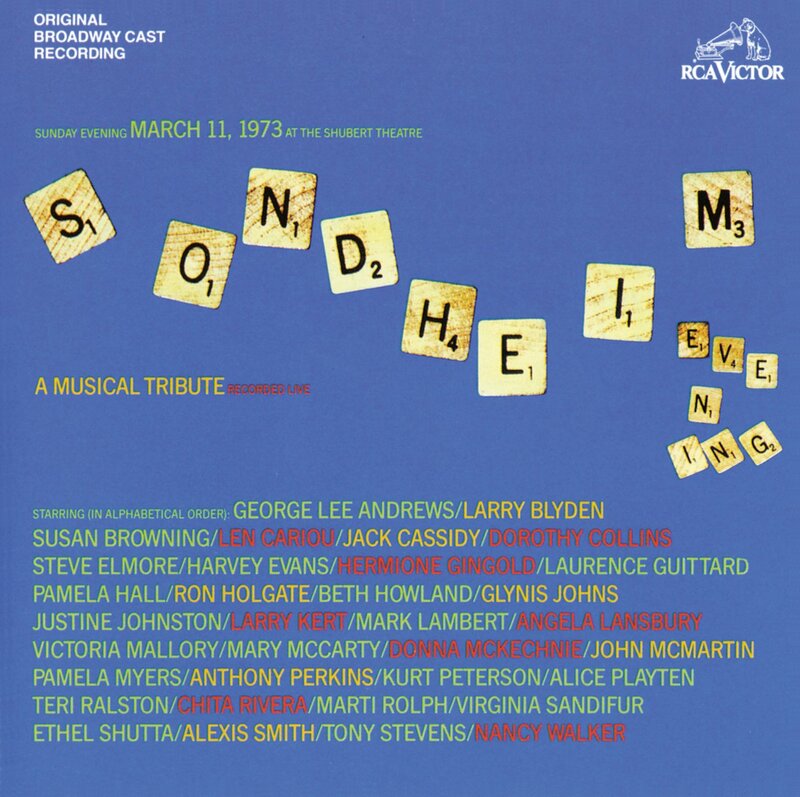 The Broadway cast recording of Sondheim: A Musical Tribute was recorded on sixteen-track analog tape and was released in 1973, shortly after the concert, as a two-LP set. Within a year it was out of print and was not available again in any form until this reissue. With the use of digital equipment to remix and re-master, an attempt has been made to clean up some of the cloudiness of the original source tape while keeping the “live,” you-are-there feeling. Because of a few cases of laryngitis, a few technical problems in the original recordings and the space limitations of the LP format, some of the material performed that evening was not included on the initial release. For this reissue Another Hundred People, sung by Pamela Myers, who introduced it in the original production of Company, has been restored, and the Overture, which was eviscerated for the 1973 album, has been reconstructed to its full length. – Craig Zadan, Author of Sondheim & Co.
Over the years there have been many tributes to the genius of Stephen Sondheim (we are proud to present several on this website), but this was the first and a magnificent affair to boot, with performers who had nurtured a long-time relationship with him, like Jack Cassidy, Anthony Perkins or Nancy Walker. Among the luminaries who also appeared at the Shubert on the night of March 11, 1973 were recent alumni like Glynis Johns, who was starring in A Little Night Music at the time, Chita Rivera and Angela Lansbury; others who, like Donna McKechnie, Pamela Myers or Larry Kert had headlined in at least one of his shows; as well as a whole retinue of top-name actors and actresses who had long recognized that Sondheim was the new voice in musical theatre. Fortunately, this electrifying evening was recorded for all to hear and appreciate.